One thing we can boast at Happy Valley is Dark Skies. Perfect for star gazing in the Hot tub on a cold Winters night. Return to your forest cabin and cosy up by the wood burner, toast a few marshmallows and enjoy a glass of something special in laid back luxury. Scottie's hand crafted all the beds here which are mainly King Size with some really fun bunks for the kiddies in the Woodpecker Tree Temple. All cabins come with a kitchenette, indoor and outdoor seating. Private BBQ Area, Fire pit & enjoy a Woodland garden. Why Not buy your loved one a Gift Voucher for a Mini break in the New Year? The Woodpecker pictured here is the perfect retreat for a family. Where kids can roam free in the forest. Experience some wilderness culture and take them on a mini adventure. There's all your home comforts without the distraction of TV's and consoles. Perfect for making memories! 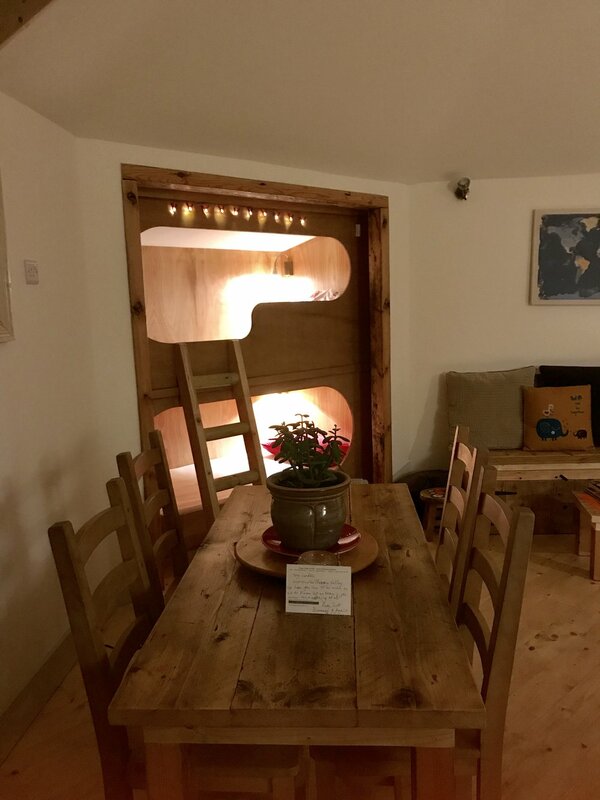 We have availability in our Woodpecker Cabin over Christmas this year. Our newest cabin has been a total hit with families with the bunk beds providing much excitement for the children. You can see the childrens play area from here also. There's endless walks and beautiful scenery in and around Happy Valley. Bring your bikes if you love riding down the winding back roads of unspoilt scenery. Or, you can hop in the car and head to nearby attractions in North Norfolk. Some of our favourites include, Sandringham park, Old Hunstanton, Snettisham RSPB, Brancaster Beach, Holkham and Wells-Next-The-Sea. Stop by at Thornham Drove Orchards for some independant boutiques, childrens shop and sample some local catches at Shucks at the Yurt restaurant, Guerneys Fish Shed or Erics Fish and Chips. Visit Burnham Market or stop by Creake Abbey for some more independant shops. Wind your way home for a Hot Tub under the stars. Forest Bathing at it's best. Feedback from a recent guest - "it stimulates all your senses. The smells from the wood fire and the fir forest. It ALL makes you feel so alive!." Just down the road is the picturesque Village of Massingham. Our Local Pub the Dabbling Duck is the perfect place to find a bite to eat if you can't be bothered to cook. They also do take away pizza on a friday night. In other news - Winter conditions are testing Scottie & Billy but the new Woodland Lodge is going up a treat. Incredible Norfolk Skies have graced us this Autumn. There's a small debate happening on site as I want to call it Toad hall & Scottie isn't so keen. I think there will be a little competition going on instagram and Facebook over the next week or so to determine the name so keep an eye out. Immerse yourselves in the forest in North Norfolk this Winter. * - exludes School Holidays & Bank Holidays. Our newest addition to Happy Valley Glamping is the Woodpecker Tree Temple. She’s been tried and tested this Summer and the feedback has been amazing to say the least. If you’ve never been Glamping then this is the perfect start. Ideal for families and couples alike. There’s more space in the calm, round, living space for those not so idyllic days. Complete with games. Dining table and chairs. Wood burner. Radio. Kitchenette - hob, toaster, kettle, cooking utensils, cafetière, plates, pots and pans etc. And basics such as Tea, coffee, salt, pepper and cooking oil. Take full advantage of our Norfolk Winter Deals where you can stay off peak for 3 nights for the price of 2 and there's some fab mid week one night deals. Email - hello@happyvalleynorfolk.co.uk or call Katy on 01485 600719 to find out more details. A beautifully workable space to connect in nature and with each other. Everyone loves a room with a view and in the Woodpecker you've got both Woodland & open farmland views. The Shower and Toilets at Happy Valley. During the winter months all cabins have their own private shower and toilet room with waterfall showers. All heated. All our future builds at Happy Valley will have en-suite facilities. Take a walk up Troys hill and say hello to the Happy Valley Short Horns. You will then spot the Treehouse in the corner of the Woods. It's finally taking shape. Billy and Scottie have been full steam ahead and our Treehouse is well underway & i'm a little over excited about it all. Autumn just seems to get more beautiful year on year. It's becoming my most favourite Month and the perfect time to grab a cheeky weekend away in North Norfolk. All our Cabins are heated so make yourself cosy and immerse yourselves in Nature. We took a trip to Snettisham Beach to watch sundown. Just 15 minutes from Happy valley it's our Closest Beach. We walked over the dunes and my hairs stood up on end. There were thousands of birds all stood on the seas edge and this incredible sunset. We are so blessed to live in such a beautiful county. RSPB Snettisham is not as well publisised as the other nature reserves and we can share it with you. Did I mention we have a wood fired hot tub? It's going down an absolute treat. Excitedly planning private additions to each cabin next year. Make sure you follow us on Facebook as we sometimes post cancellation deals on here. Super Excited to announce that our Wood Fired Hot Tub has arrived. We spent some time finding the best spot in the woods. Over looking the pond in a small glade. Surrounded by trees but with a view of the stars. The beginings of our Woodland Spa. We've spent the last week Testing, testing and more testing & now she's ready for you to experience. We are taking the art of Forest Bathing to another level - We have experienced the benefits of spending time in the Forest. Natures Therapy is almost instant and are so grateful that we can share this little bit of magic with you. Nestled away in a private location you can stoke up the fire, sit back and relax. Forest Bathing whilst Forest Bathing! There's something very romantic about a wood fired hot tub. 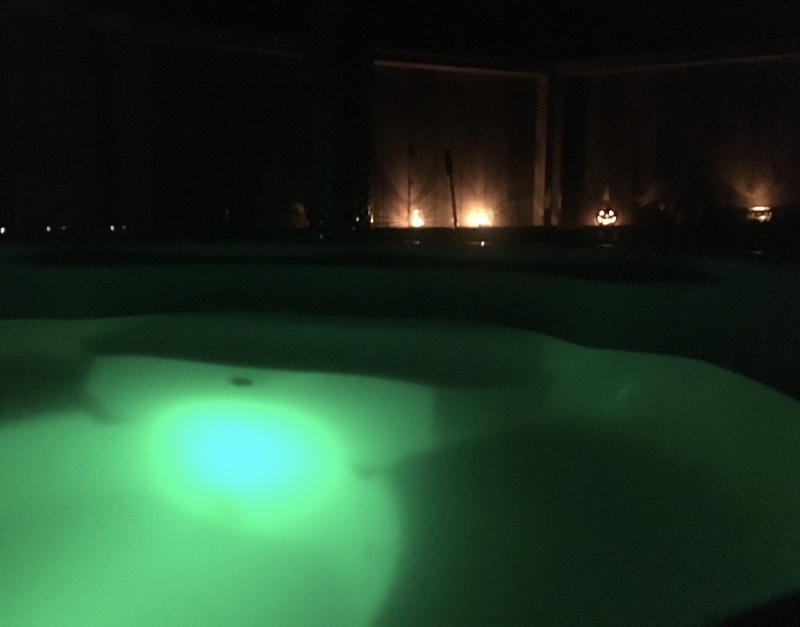 As it's such a magical setting we decided to create a Halloween Hot Tub experience this year. We dressed the stage with Pumpkins and fairy lights, hung a pumpkin pinata & called on those friendly ghosts! It's safe to say it's gone down a treat here at Happy Valley. We wanted to create a haven for couples and families alike. A place to escape to and feel a milion miles away from the stresses of life. The Feedback has been just that. 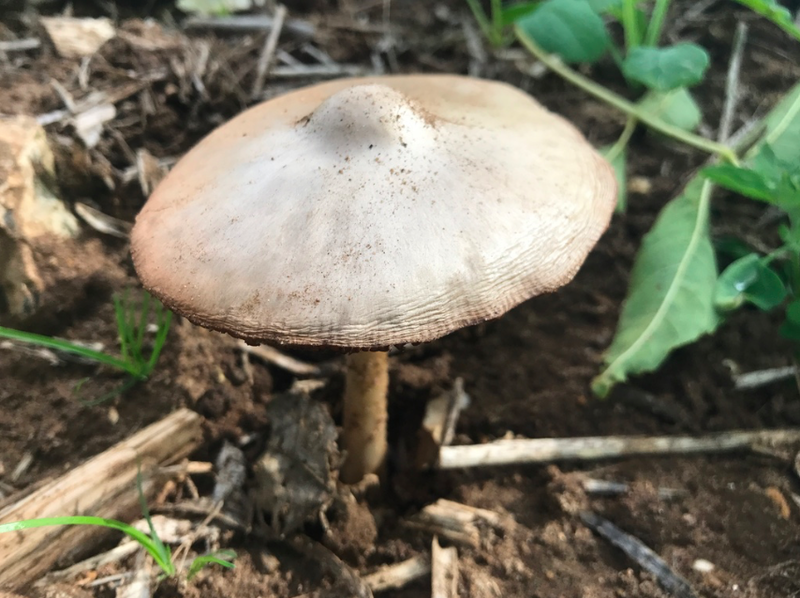 We've had guests who live not too far away say they still feel like they're in another world when they come to Happy Valley. We hope you enjoy it just as much as we do. 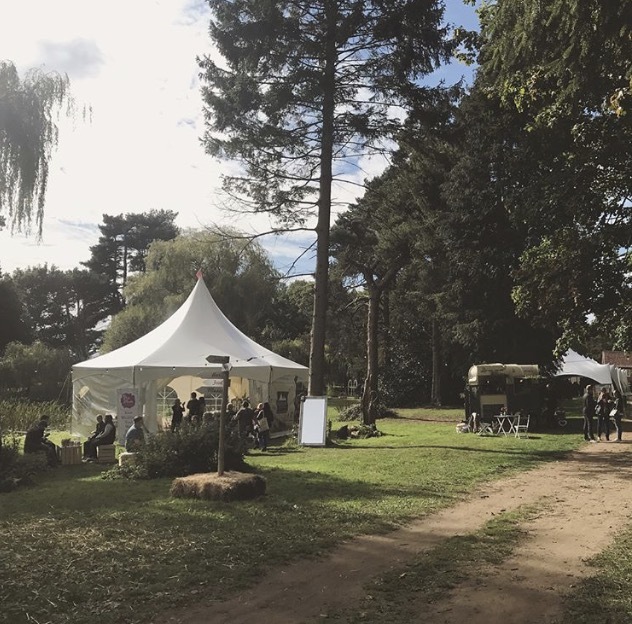 Together with Twisted Melon Promotions & Pia Plum Events the planning and hard work paid off and the first ever Happy Valley Wedding Festival i'm pleased to say was a success. The Party Barn at Happy Valley was transformed over the last month. Those special added touches just finished it off nicely. Here we have Flowers from Flowers on the Green. Isla's Illuminations launched Norfolks First suspended light display for the occasion. Alex from Castle Acre Canvas supplied the main Capree Tent which housed many of the Wedding Suppliers - Here he is just after he'd put it up. Harrison Chocolatiers - Bespoke chocolates and desserts for chocolate lovers for every occasion. Vintage Partyware exhibited some of their fab props and also provided the arch at the head of the Bridge. The Travelling Bluebird at the Wedding Festival - Highly Recomended. Their food is beautiful, service spot on and it looks a picture to. Peacock Cake Company loved how you could sample some of the fab cakes on offer. Beetroot Dining cater for Weddings and Events. 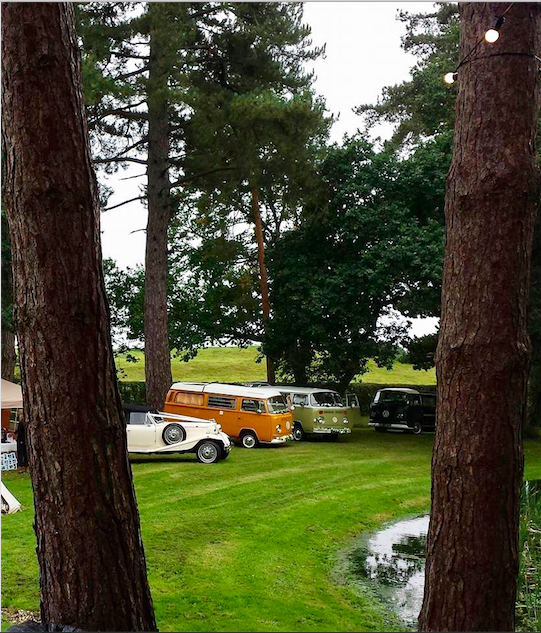 Happy Valley is a Woodland & Open Space Venue for you to create the Wedding You Want. The Fabulous Sam who plays and Sings in Bear Club also is a photographer - Rook Photography and Video - he took the Shakleton Trio into the Woods for a little ad lib photo shoot and produced these beauties. BIG thanks to WES at Wesigns for all the fab signage. WES is the perfect man to go to for all your Signage needs. Tom and Fi's beautifully choreographed Vintage Wedding at Happy Valley. Toms mother, Louise Morrissey, took the intimate service on the island. The Photographer was Ben Chapman from Sutton Bridge with a few from Sophie Gott. Happy Valley has some enchanting woodland and open space areas so you can choose which backdrop you like for your wedding. Perfect for creating areas for a festival wedding or you can create an area to use for a more intimate wedding. Tom and Fi had a blessing on the island surrounded by their gorgeous family. We have a number of bell tents which can be used for extra spaces, glamping accommodation, gin or Prosecco tent perhaps! Loved the beautiful made photo booth for all the guests to enjoy. The bridesmaids looked sensational. We loved this flirty Vintage pose.